This morning we woke to find an email from Chris Bell. His boat is also being built by Ben Harp and must almost be completed. 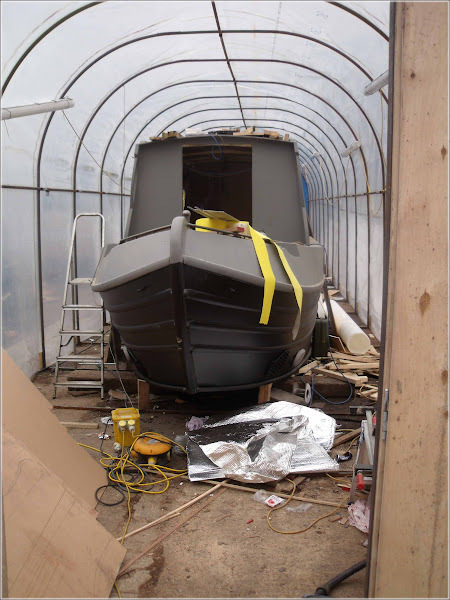 Although Chris went to Great Haywood to look at his lovely new boat he also visited Hixon where he saw Waiouru sitting under a plastic shelter and being worked on. Chris took a photo which he has very kindly emailed to us. We are most grateful! This is only the third occasion where we have received a photo and it’s the first of the fit out. The excitement is palpable as we attempt to glean as much information as possible from the photo. I have zoomed in to the front cabin doors and can see some wiring has been installed. There are also possible signs framing for a partition might have been installed. I don’t believe the lining has been fitted and there doesn’t appear to be any indication the secondary bubble-foil insulation has been fixed. However I can see what appears to be a pile of loose aluminium foil in the foreground which is a very positive sign. We can see the anodes on the outside of the hull and I could make out the grills over the bow thruster tube appear to be bolted into place. I’ve also noticed either side of the bow on the gunwale there is a piece of flat steel welded on top of small steel uprights. It looks like a tiny handrail. I’m not sure what they are used for and we didn’t include them in our specifications? I’m not sure if it’s just the effect from the “poly-pipe” but the weather outside looks a bit grim! You must be very very excited. I remember years ago when we bought a sailing boat that I would show anyone who stood still pictures of her hull, engine mounts.... well just about every part of her. Do you know when the launch date is yet?